Turf Builder is a lawn fertilizer product designed by Scotts. It contains all the nitrogen and nutrients needed to help keep your lawn growing vigorously. A healthy, fast-growing yard is less susceptible to lawn diseases like rust, and is also less prone to weed invasions. Apply Scotts Turf Builder Lawn Fertilizer with 2 percent Iron, the company's all-season version of the Turf Builder product, to feed your grass' hungry roots and keep your landscape green and healthy. Mow your lawn. This helps the Scotts lawn fertilizer penetrate the turf efficiently. Cut your lawn according to the height recommendations for your specific grass species. Trim warm-season grasses like zoysiagrass to a height of approximately 1 1/2 inches, according to the University of Missouri. 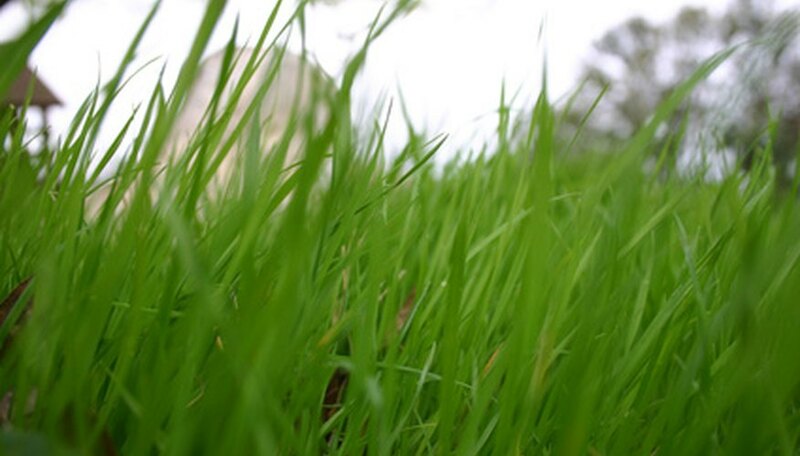 Cool-season grasses like tall fescue should be kept slightly longer at 2 1/2 to 3 1/2 inches. Fill a Scotts spreader with Scotts Turf Builder Lawn Fertilizer with 2 percent Iron. On a Scotts rotary spreader or broadcast spreader, such as the Scotts Deluxe Edgeguard, set the spreader's dial to "3 3/4." On a Scotts drop spreader, such as the Scotts AccuGreen, set it to 7 micrometers. Apply the fertilizer using the spreader. Walk or push the device in even strips across your lawn to evenly cover all areas of your yard with the fertilizer. Water your lawn so that the soil is moist to a depth of 3 to 4 inches. This helps carry the fertilizer's nutrients to the lawn's root level where it can immediately begin feeding the grass. Repeat the fertilization application every eight to 10 weeks during the lawn's growing seasons, as recommended by the Ohio State University. Scotts' fertilizers are specifically formulated to be dispensed with a Scotts spreader. All listed application rates are for Scotts-designed spreaders or broadcasters. If you're using a third-party spreader, contact its manufacturer to determine what settings on the spreader are closest to those required on a Scotts spreader. The iron in the Scotts Turf Builder fertilizer can stain your landscape's concrete and brick surfaces. If you get any fertilizer on such surfaces, sweep them immediately.